Here’s the Online Version of Honley Mail. 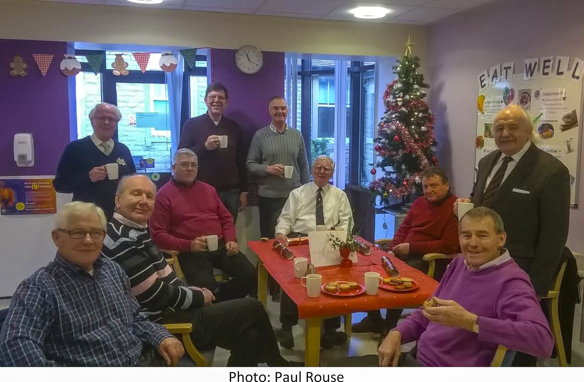 Christmas Day morning at Home Valley Hospital, Holmfirth with some members of the choir (others had left before the mince pies came out!). All kindly gave up an hour or so to entertain the patients. This tradition has been going on for many a long year and is always appreciated, long may it continue. I don’t trip over things, I do random gravity checks. Old age is coming at a really bad time. When I was a child I thought nap time was a punishment… now, as a grown up, it just feels like a short holiday. The biggest lie I tell myself is… “I don’t need to write that down, I’ll remember it “ I don’t have grey hair. I have “wisdom highlights”. I’m just very wise. If God wanted me to touch my toes, he would’ve put them on my knees. I’m going to retire and live off my savings. Not sure what I’ll do that second week. Of course I talk to myself, sometimes I need expert advice. Chocolate comes from cocoa which is a tree … that makes it a plant which means … chocolate is a Salad! Last year I joined a support group for procrastinators, we haven’t met yet. Our Musical Director, Steve Roberts, has recently been educating us in the ways music is structured and how it affects our performances. This directly follows some six new members joining the choir who, maybe like myself, do not read music or indeed understand its idiosyncrasies. Over the years through four different MD’s I have learnt a lot including: how and when to breathe and how to ‘follow’ the music as opposed to ‘reading’ it, not knowing all the note names etc…… However it struck me (Ow!) 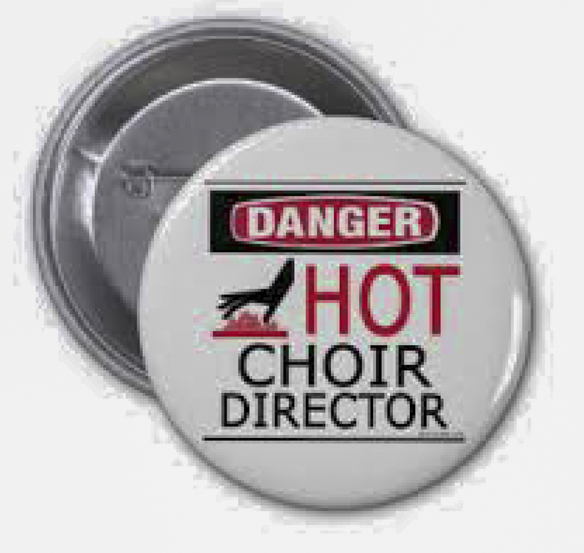 those things I now take for granted are also maybe a mystery to other choir members, new or old. So here goes: a few words we either hear, or words/symbols seen on the printed music. The written words are mainly in Italian (traditional) although English is starting to creep in. The letter p (piano) means sung quietly and pp (pianissimo) means sung very quietly. Very occasionally ppp also known as (pianissimo) is shown, meaning sing very very quietly! The letter f (forte) means sing loud and ff (fortissimo) means sing very loud. Again very occasionally fff also known as (fortissimo) is shown, meaning sing very, very loud. No doubt somebody will correct me on something above (which I welcome, that’s how I learn!) but I hope this ‘’Starter for 10’’ is useful. team of ‘’EXPERTS’’ (chuckle, chuckle fall about!) will be put to the test. You will get a personal answer and if pertinent the next edition of HM will publish both the question and answer, to further all our knowledge. No doubt we’ll soon find out what two oh one five sends. …you know that the chip oil is where you go to get your chips, not what you cook them in. …you know what a snicket or a ginnel is. …people assume you have Yorkshire Pudding with every meal. …you know Yorkshire Pudding isn’t really a pudding. …people think you have an allotment with a pigeon loft. …eh up, sithee, na then, a’reet are all part of everyday conversation. …you’ve got into a fight, or broken up the missus fighting, over ‘your’ seats at t’club. …you know it’s pronounced ‘Arrigut’. you know Hannah Hauxwell was harder than anyone. …mucky dripping make you salivate. …t’int in t’tin makes perfect sense. …you know another three or four drips will top off your pint properly. More to follow in next edition. If YOU have some good ones email me. The best thing since Julie Andrews! I can’t believe it is two years since I started. We have sung well over the last year and I have been very –leased with the progress of the choir in general. The highlights for me and probably you were the three concerts at the Town Hall – with Lesley Garrett, the Heroes concert and our Christmas concert! All three concerts so very different but enjoyed by everyone. We need to work on the quality of our singing this year and making sure we look after our voices and to always aim for the best possible balance, both between and within sections. Recruitment really has to be the buzz word this year and beyond, we must never stop telling people about the choir and always look for avenues to bring new members along. Seven new members this year is not bad going, but there will always be those who leave for one reason or another and we need to keep the choir strong and healthy. As mentioned at our first 2015 rehearsal I have the year more or less planned out with some major events along the way, not least a hoped for recoding in May/June. It’s about time we had something to show the choir off and I believe we are ready to take on the challenge. So, keep up the good work – learn your music (which isn’t usually a problem) – but do start To learn new words or refresh old ones – this is the key to keeping up-to date! If you miss a rehearsal, read through a few songs to keep ‘the little grey cells’ working! But above all else continue to enjoy yourselves and have fun! I am very happy I decided to join the choir and really can’t believe how quickly the time has flown by. This entry was posted on February 9, 2015 by honleymvc. It was filed under Uncategorized .